Boats and marine sports will be the focus of this weekend’s Marine Festa. For the outdoor enthusiast who loves to be on or near the water, this weekend’s Okinawa Marine Festival is just the ticket. 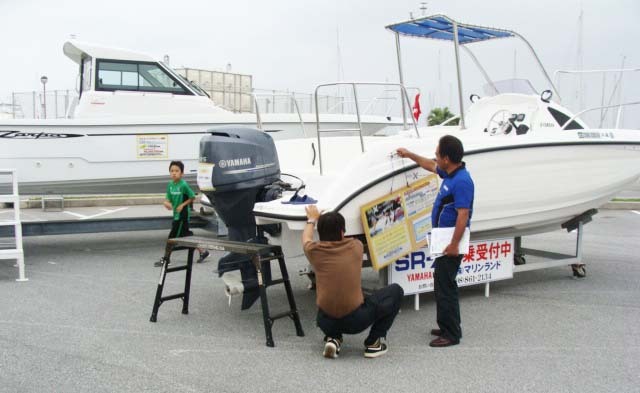 Sponsored by the Okinawa Marine Festa Executive Committee, the Saturday and Sunday festival is at the Ginowan Marina Special Space, next to the Convention Center. Admission is free for the festival, which runs 10 a.m. ~ 5 p.m. Saturday and 9 a.m. ~ 4 p.m. Sunday. The 2013 array of new models of boats, sailboats, wet bikes, parts, marine wear and boat fishing gear will be on exhibit. The consultation corner will be open throughout the event and specialists in acquisition of boat license and boat storage will be available. There will also be a series of special events, including boat game fishing and a mini-boat festival.